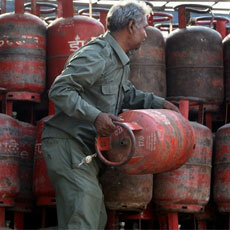 Surat, Sep 30 A total of 5.5 crore additional households will be provided cooking gas connections over the next five years covering almost two-thirds of the country, Union Petroleum Minister Murli Deora said here Wednesday. He said this would increase the coverage of liquefied petroleum gas (LPG) connections to 16.5 crore households in India from 11 crore at present. Speaking at a function to dedicate a 1147.5-MW gas-based power project built by Torrent Power at an investment of around Rs. 3,000 crore at Sugen near here, Deora said 200 towns and cities in India would be covered under the City Gas Distribution Network (CGD) over the next five years. The petroleum minister said priority in allotting LPG connections would be given to the rural areas. (BPL) -- from the existing 60,000 to 150,000. He also said: "BHEL (Bharat Heavy Electricals Limited) and Siemens are discussing collaboration in power sector." Chief Minister Narendra Modi, who inaugurated the power plant, announced that the entire tribal population of the state would be provided free power for agricultural purposes to mark Gujarat's golden jubilee year, 2010. "All those tribal farmers who have applied for an agricultural power connection will be provided the same", he added. Later, Torrent Power chairman Sudhir Mehta said the installed capacity of the Sugen power project which he claimed was the largest gas-based power project in the private sector, would be scaled up to 4,500 MW in the second and third phases within the next five to seven years.